Propeller Sailboat | Project | Kids VT - small people, big ideas! Launching a new boat is always a blast. Here's an easy and affordable way to build one at home. 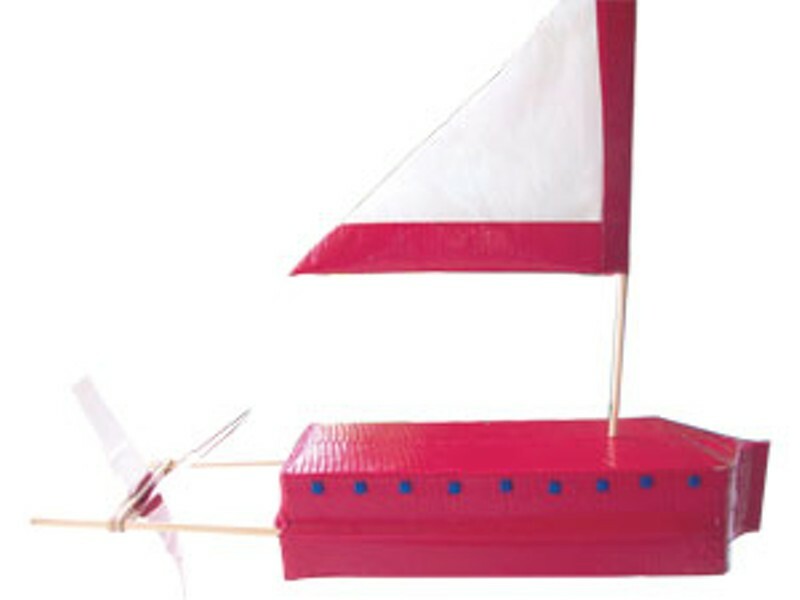 This propeller-powered vessel is made mainly from recycled materials you probably have handy. It should take about an hour for you and your kids to put it together, from start to finish. Build two or more, paint your names on the sides, and embark on a backyard boat race! Bonus: It'll give you an opportunity to talk about measurements, teach kids nautical terms such as bow and stern, and explain how a propeller works. Begin by cutting the milk or juice carton in half, lengthwise. When you're done, cut the angled portion off the top of one half. Then, pinch the sides slightly and slide that half into the other one, making a solid rectangle of the two pieces. Next make the boat water resistant by sealing it with duct tape. Using duct tape, attach a chopstick to the left and right — or port and starboard — sides of the boat. Make sure that at least two inches of each chopstick extend beyond the stern. This will allow the propeller to clear the end of the boat as it spins. Cut a 7-inch square from a piece of the plastic bag. Fold the square in half, making a triangle. Lay a short edge of the triangle on the sticky side of a piece of duct tape, then fold the tape over the edge. Trim the ends of the tape to the shape of the triangle. Lay the second short edge of the triangle on another piece of tape. Before you fold the tape over the edge, place a chopstick along the edge of the triangle so that when you fold the tape over, you attach the triangle to the chopstick. Fold the tape and trim the ends to the shape of the triangle. Make a straight cut in each piece of thick plastic. The cut should be halfway down the length of the pieces, and should extend only to the middle. Don't cut the pieces in two. Insert one piece into the other at the cut, forming an X. For a sturdier propeller, tape the joints of the X. Stretch the rubber band around the chopsticks attached to the boat so that the rubber band is taut — depending on the size of your rubber band, you may need to double up on the loop. Flatten the propeller and poke two of the blades through the rubber band so that strands of rubber band sit in opposite "quadrants" of the propeller blades. This will keep the propeller on the band when spinning. Poke a hole in the top of the carton and insert the sail. Put your boat into the pool, pond or bathtub, wind up the propeller, and shove off!